First time in Paperback! Selected for the Top 10 Native American Books for Elementary Schools by American Indians in Children’s Literature. Little Zoo Sap and his family are moving from their summer home on the coast to their winter home in the deep woods. Unnoticed, the youngster tumbles off the end of the sled. Alone, cold, and frightened, Zoo Sap cries, and his cries attract the forest animals. 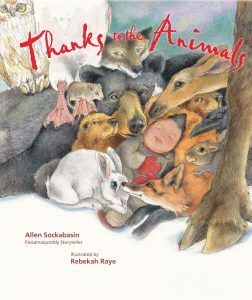 Beginning with beaver and ending with the great bald eagle, the animals rush to protect the baby and shelter him from the cold until his father returns.